New Israeli Defense Minister Avigdor Liberman had the briefest of honeymoon periods after taking up his position at the end of May. 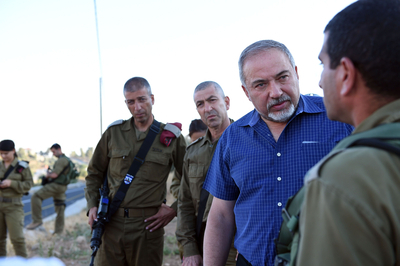 Within a couple of weeks of his appointment, a new surge in Palestinian terrorist attacks began targeting Israeli civilians, placing Liberman, and the defense establishment he heads, under a new test. The greater Hebron region in the West Bank quickly emerged as the epicenter from which most of the attacks originate, and Liberman has begun implementing his security policy, which calls for distinguishing between Palestinian areas. Under Liberman's policy, Israel deploys very firm security measures in areas that generate much terrorism, while easing conditions for Palestinians in areas that do not. In June, two Palestinian gunmen from the town of Yatta, near Hebron, opened fire on Israeli civilians at a Tel Aviv restaurant, murdering four people. A subsequent investigation revealed that the terrorists, aged 21, acted under the ideological influence of ISIS. A third accomplice was arrested after the attacker told Israeli authorities the cell initially planned to attack a passenger train, before selecting the crowded restaurant in Tel Aviv's Sarona Market. Toward the last phase of the Muslim Ramadan holiday in late June – a time that has seen a spike in jihadist attacks on Israelis in recent years – a 17-year-old Palestinian sneaked into the home of an Israeli family in Kiryat Arba, near Hebron, and stabbed a sleeping 13-year-old to death in her bed, before being shot dead by armed civilians. A day later, a Palestinian terrorist cell carried out a drive-by shooting on an Israeli family traveling in their vehicle on a West Bank road south of Hebron, shooting dead a father of 10 and inflicting gunshot wounds on the man's daughter and wife. Later that day, a Palestinian knife attacker from Tul Karem went on a frenzied attack on the streets of the Israeli coastal city of Netanya, seriously injuring a pedestrian before being shot dead by an armed civilian responding to the attack. At that stage, the Israel Defense Forces (IDF) did something it had not done for two years, and placed greater Hebron – a region encompassing 700,000 Palestinians, under closure. Local residents are not permitted to leave the area except for humanitarian purposes. The last time the IDF had taken such drastic action was after three Israeli teenagers were kidnapped and murdered by a Hebron Hamas cell in 2014. Senior military sources said in recent days that the closure is not a form of collective punishment, and should not be viewed as such. Rather, they said, it is a vital tool that creates intelligence leads which can direct security forces to the location of the cell. A failure to capture or kill the cell's members will result in additional terrorist attacks, and more casualties, the sources warned. This time around, as in 2014, the IDF has increased its personnel in the area, deploying two back-up battalions, and beefing up troop presence on West Bank roads. The Shin Bet domestic intelligence agency leads the hunt for the shooting cell. There are defense commentators and experts in Israel who believe that Liberman's policies mark a change from the previous security policy, which was led by Moshe Ya'alon. Ya'alon called for distinguishing between Palestinian civilians and terrorists everywhere in the West Bank, and he did not advocate a differential, area-based policy. While Ya'alon sought to provide as many Israeli work permits to Palestinians as was safely possible (after they had been vetted by security forces), Liberman has taken a different approach. In places like Bani Naim, the village from which the knife attacker who murdered the Israeli girl came, all residents – most of whom are members of the knife attacker's clan – have had their Israeli work permits revoked. Liberman believes that only this kind of deterrence stands a chance of quelling a new wave of Palestinian violence. He would not be able to push through such measure alone; Liberman requires the approval of Prime Minister Benjamin Netanyahu, and a majority in the security cabinet, to be able to make any changes. However, some defense experts in Israel have taken a wary view of extensive measures that harm the economic conditions of Palestinians, arguing that this approach ultimately can recruit more jihadists. This is a debate that has raged in Israel in the past, and looks set to continue into the foreseeable future. Yet it is a debate that – while legitimate – deserves to be placed in a wider context. For the IDF, the mission remains the same, irrespective of who is defense minister. The army must protect roughly 500,000 Israelis who live in the West Bank, amid 2.5 million Palestinians. At the same time, it must work around the clock to prevent lone-wolf terrorists and organized, highly armed cells in the West Bank from terrorizing Israeli cities and flooding them with death and destruction. This is a mission the IDF and Shin Bet carry out with a remarkable degree of success. The Palestinian jihadists who set out on murder missions target settlers because they form the easiest, closest targets. But if they could, the jihadists would just as willingly cross the Green Line into Israel proper and attempt to butcher civilians in Israeli cities, as the Tel Aviv and Netanya attacks demonstrate. As senior members of the IDF General Staff point out, terrorism has been afflicting Israelis since the formation of the state – and well before its founding – and no senior defense officials realistically expect any single measure to end attacks for good. The realistic goal, according to this view, is to come up with the right balance of sticks and carrots that will keep levels of terrorism to a minimum, and to avoid steps that could inflame the atmosphere further. One of the central pillars of this approach has been the tacit security coordination between the IDF and Palestinian Authority (PA) security forces. The PA, threatened by Hamas, and the prospect of chaos, is serving its own interest by coordinating security with Israel. And yet, as with so many other aspects of reality in the Middle East, this strategy too is filled with contradictions, since the PA also continues to incite to violence, and senior Palestinian officials, like the governor of Hebron, have even expressed solidarity with the unrepentant relatives of the terrorist who murdered a young teenager in her bed. The coming weeks and months will reveal whether the latest surge in attacks represents the start of a bigger shift towards confrontation between West Bank Palestinians and Israel, or whether the Israeli defense establishment has been able to, once again, put out the blaze before it turns into an inferno. No matter what course of action we take to protect ourselves we are going to be villified by the worldwide Network of Leftists who will paint a non-existent picture critiqued and validated by the UN or should I say the League of Nations resurrected and the Parliament of the New Europe the EU that truly is the Courts of Old Europe dressed in New Clothes calling themselves by a new name. The IDF and SHABAK must make Military and intelligence decisions based on experience and military science not Political Correctness or International Relations. It's noteworthy that sice the American led coalition Air Campaign against ISIS there isn't night videos of civilians , women and babies being killed in Air Strikes. Does anyone believe that women and babies are not being killed in Air Strikes? Then cometh the Russian AirForce. How many believe every strike struck only military assets? So for Israel there may be a lesson in all of this picture. MediaPropaganda both print and video is a form of warfare as powerful as any Tank Battalion. What the Russians, Americans the Coalition did in Syria/Iraq and the Frenchdid in Mali to quell the Press without an uproar; We need to be doing the same. Yes we are a Democracy but one that is at an existential war. Is it just me, or does it seem like terrorist attacks against Israel appear to have increased since the Obama administration came into office...particularly during his second term? I think Obamas' coldness towards Israel has emboldened terrorist groups like ISIS. I personally think Israels' policies towarsd PAlestine have gotten a lot better in recent years, and I think it behooves the PAlestinians to do their utmost in preventing what they can of attacks against Israel. I think the area based policy is a good idea as it further shows the "ordinary Palestinian " that their conditions improve when attacks against Israel diminish, giving them motivation to form networks of their...that can "Take care of their own"/take are of jihadists in order for them to have better conditions...and perhaps form a legitimate political party to run the West Bank and Gaza - Hamas obviously not included. I also think that Israels' new policy and improvement in the West Bank will help show the world that indeed Israel is not prejudiced towards the Palestinians, and is not trying to commit genocide against them. Further note : I didn't realize just how many PAlestinians there are - 700k in Hebron area alone? Amazing.